We went in to this whole “Ian will take classes at the local junior college” with no idea how or if this would work. 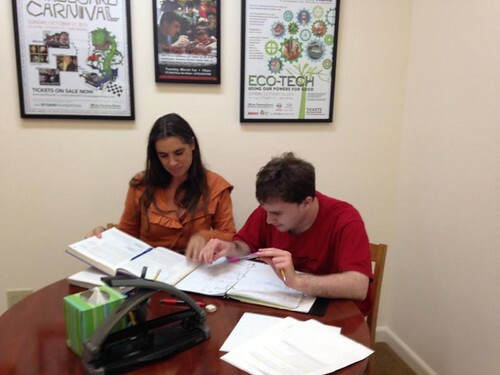 Ian is a medium verbal autistic and did not complete a high school diploma. Would the college accept us inserting an aide into the situation? Would Ian be able to do the work? Ian had spent all of his public education in Special Education programs where the level of challenge was low. We knew we should try – we really had no idea if it would work. We have been amazed, relieved, and inspired by how well it has all turned out. Ian has established a solid start on his college education. For Ian’s second and third semesters he took introductory math classes at College of Marin (hereafter COM): Math 085 (Arithmetic Skills) and Math 095 (Basic/Intermediate Math Skills). We had an aide attend with Ian for the first week or so and after that Ian attended independently. Ian has earned B’s and B-minuses. In the most recent semester (Spring 2016) Ian is taking a remedial English ENGL 062 (Developmental Reading/Writing) for six units. With Ian attending independently the main issue becomes whether Ian has understood assignments correctly and is he keeping up with all the work. In his math classes this was not an issue because math classes tend to have one thread of work building upward. However, English classes are squarely in the heart of his disability and he has often slightly misunderstood assignments. The complexity of college English classes is also much higher. Above is Ian waiting to catch the bus home from school. 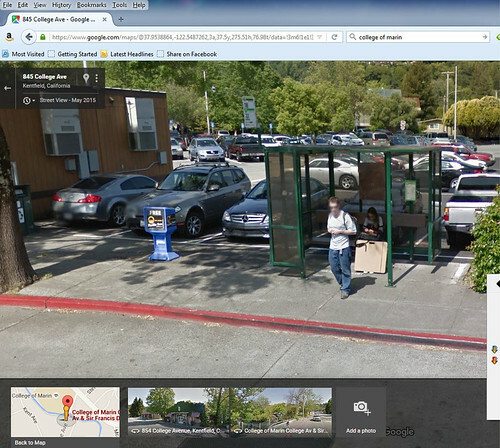 It’s great how we can use Google Street View to check up on him. We checked in with Ian almost every day on his homework. Over time Ian has become self-motivated on working on his assignments. On the math classes we would help with studying for the final exams and help Ian with which topics to focus on. This semester’s English class has gone better than we ever hoped. The work is focused on writing, vocabulary, and reading. It is just at the edge of Ian’s ability. Ian is medium-verbal and we were worried whether Ian would be able to keep up. We are thrilled that Ian is making progress on this subject and Ian’s reading comprehension and writing ability are improving. Ian did mostly well while Sara was away on her maternity leave but Ian did get a little off track. Ian missed some assignments given verbally in class and the web page for the class had not been updated. We ramped up making sure Ian knew about all assignments and the teacher was flexible about letting Ian turn in the missing assignments late. The class was extremely challenging for Ian but he earned a B in lecture and an A in the lab and has achieved a solid 3.10 overall GPA. Another win: during our semester meeting with Ian’s academic counselor to plan his next semester the counselor urged us to consider skipping a GED and instead have Ian work directly on earning an AA degree. Ian was happy about this plan. The GED has always felt like a step backwards but a college degree feels like progress to everyone. One class at a time. We feel the focus on one class at a time has been key to Ian’s success. In the English class there are reading assignments, writing assignments, and vocabulary/spelling assignments all with different start and due dates. It has been at the edge of Ian’s organizational skills to manage this and he has made some mistakes. If there was a second class’s assignments he was also juggling, we feel it would be too much for him. Maintain good communication with the professor and the school. College of Marin has been incredibly supportive and has been flexible about allowing our aides to be in the room when needed. We helped Ian maintain contact with his professors by email and attending office hours. Attend EVERY class meeting. If the student attends EVERY class meeting it really helps! Amazing. This sounds easy but we know from working with others that just attending can be a challenge. Work (a bit) on homework nearly every day. Only one class – easy, right? All of these classes caused Ian to need to look at fundamental material so the total workload was pretty high. After we established the daily homework routine, Ian began to own it and do his homework on his own.